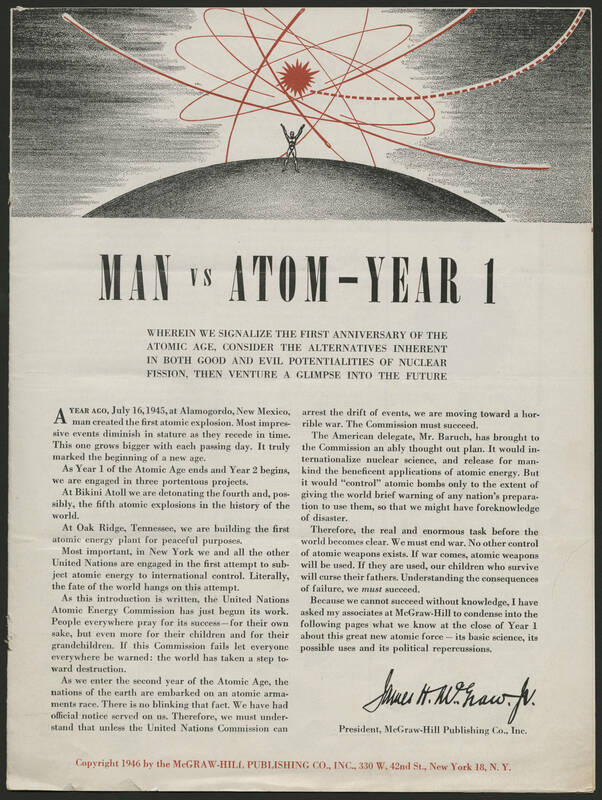 MAN VS ATOM - YEAR 1 WHEREIN WE SIGNALIZE THE FIRST ANNIVERSARY OF THE ATOMIC AGE, CONSIDER THE ALTERNATIVES INHERENT IN BOTH GOOD AND EVIL POTENTIALITIES OF NUCLEAR FISSION, THEN VENTURE A GLIMPSE INTO THE FUTURE A YEAR AGO, July 16, 1945, at Alamogordo, New Mexico, man created the first atomic explosion. Most impressive events diminish in stature as they recede in time. This one grows bigger with each passing day. It truly marked the beginning of a new age. As Year 1 of the Atomic Age ends and Year 2 begins, we are engaged in three portentous projects. At Bikini Atoll we are detonating the fourth an, possibly, the fifth atomic explosions in the history of the world. At Oak Ridge, Tennessee, we are building the first atomic energy plant for peaceful purposes. Most important, in New York we and all the other United Nations are engaged in the first attempt to subject atomic energy to international control. Literally, the fate of the world hangs on this attempt. As this introduction is written, the United National Atomic Energy Commission has just begun its work. People everywhere pray for their children and for their grandchildren. If this Commission fails let everyone everywhere be warned: the world has taken a step toward destruction. As we enter the second year of the Atomic Age, the nations of the earth are embarked on an atomic armaments race. There is no blinking that fact. We have had official notice served on us. Therefore, we must understand that unless the United Nations Commission can arrest the drift of events, we are moving toward a horrible war. The Commission must succeed. The American delegate, Mr. Baruch, has brought to the Commission an ably thought out plan. It would internationalize nuclear science, and release for mankind the beneficent applications of atomic energy. But it would "control" atomic bombs only to the extent of giving the world brief warming of any nation's preparation to use them, so that we might have foreknowledge of disaster. Therefore, the real and enormous task before the world becomes clear. We must end war. No other control of atomic weapons exists. If war comes, atomic weapons will be used. If they are used, our children who survive will curse their fathers. Understanding the consequences of failure, we must succeed. Because we cannot succeed without knowledge, I have asked my associates at McGraw-Hill to condense into the following pages what we know at the close of Year 1 about this great new atomic force - its basic science, its possible uses and its political repercussions. James H. McGraw. Jr. President, McGraw-Hill Publishing Co., Inc. Copyright 1946 by the McGRAW-HILL PUBLISHING CO., INC. 330 W. 42nd St., New York 18, N. Y.